The magic of Trinidad and Tobago Carnival: Traditional masquerader Tracey Sankar-Charleau and her son Jude getting ready for their performance at Adam Smith Square on February 23, 2017. Photo by Maria Nunes, used with permission. The music for Carnival 2017 is rich  and eclectic  — and it has grabbed much of the attention as partygoers dance, gyrate and “jump up” to its hypnotising beats. 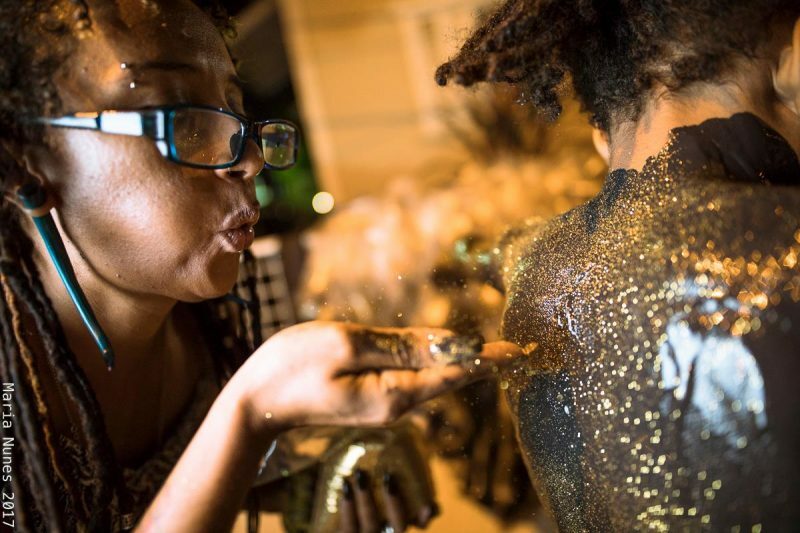 But if soca is the heartbeat of Trinidad and Tobago Carnival, the “mas” (short for “masquerade”) is the heart itself — as pure as it is wicked, and full of energy. Nunes’ discerning eye offers an intimate look at this year's portrayals. It's like being there…almost! A participant at the 2017 stickfighting preliminaries, Moruga, south Trinidad. Photo by Maria Nunes, used with permission. 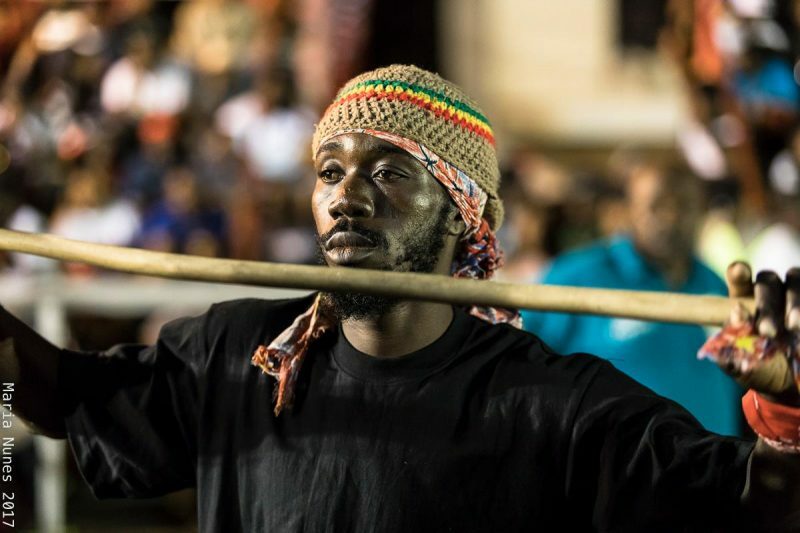 Stickfighting is a centuries-old tradition (dating back to slavery) where men would duel with “bois” (sticks) in “gayelles” (rings), accompanied by chanting or singing (usually in Patois) to the beat of African drums. 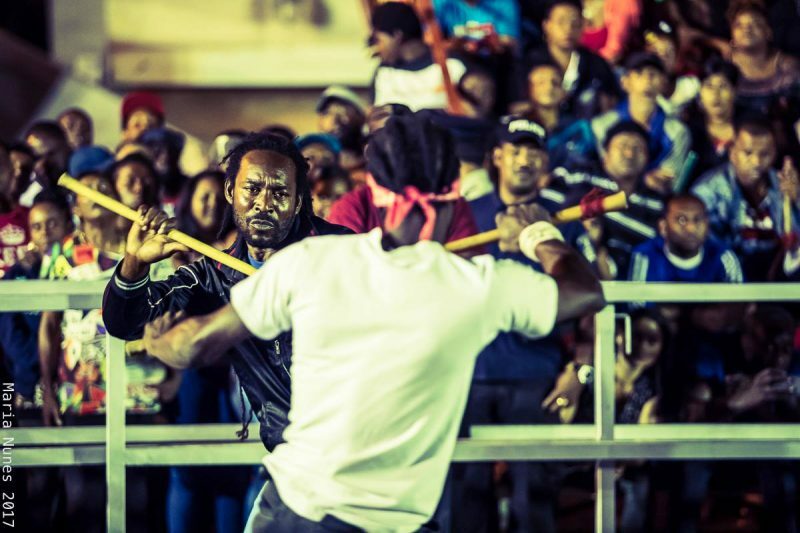 The 2017 stickfighting preliminaries in Moruga: Zangi of Bois Academy (left) battles Chuffy of Rio Claro. Photo by Maria Nunes, used with permission. 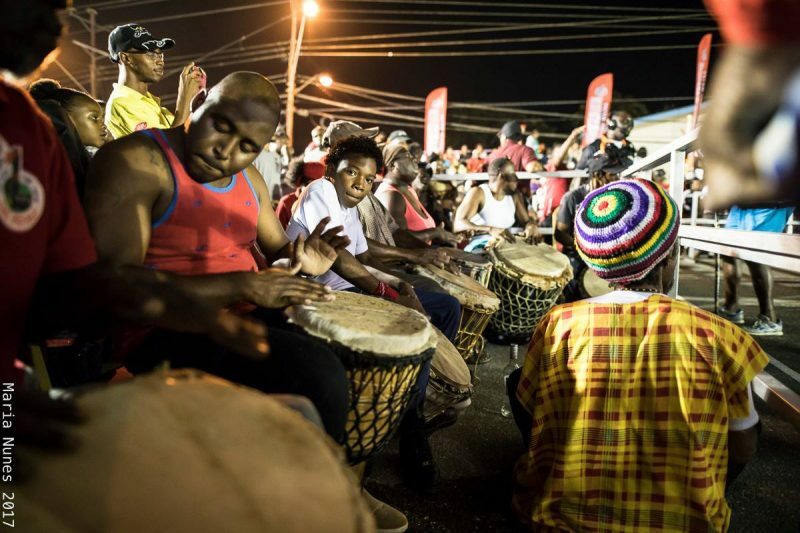 Molombo Drummers at the 2017 Stickfighting preliminaries, St. Mary's Junction, Moruga. Photo by Maria Nunes, used with permission. Large crowds would gather to witness the fierce fights, which would, at times, result in the maiming — or even death — of one of the opponents. The winner would enjoy the status that came with his triumph, which carried a lot of social currency. 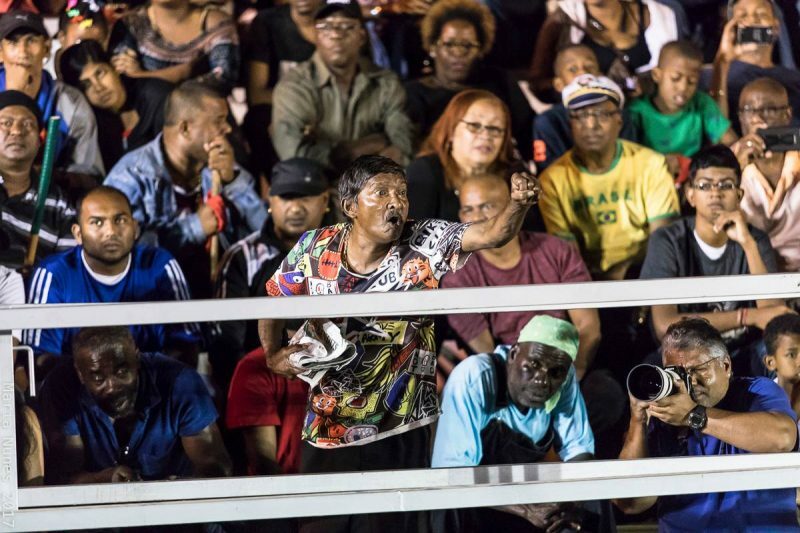 A spectator gets caught up in the action at the 2017 stickfighting preliminaries in Moruga, Trinidad. Photo by Maria Nunes, used with permission. The practice was banned by the colonial authorities in 1880 in response to the Canboulay riots , but was re-introduced (with strict rules) in 1937. 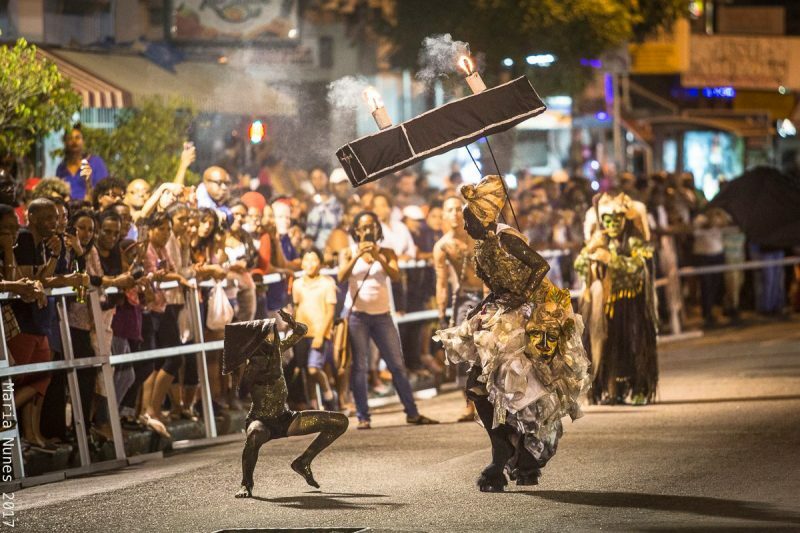 Each year, the Canboulay riots are re-enacted  and remembered as a sign of resistance, celebrating the rebellious spirit that forms the foundation of the festival. 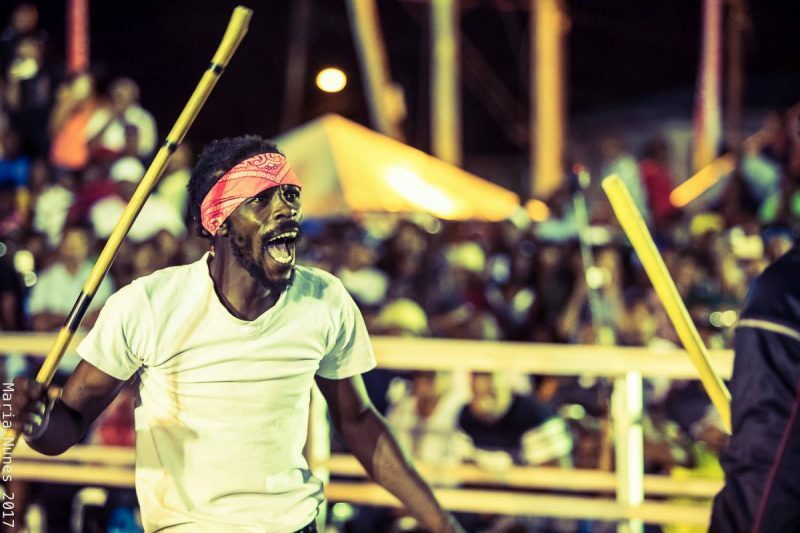 Chuffy of the Rio Claro gayelle at the 2017 stickfighting preliminaries in Moruga. Chuffy was King of the Rock in 2015. Photo by Maria Nunes, used with permission. 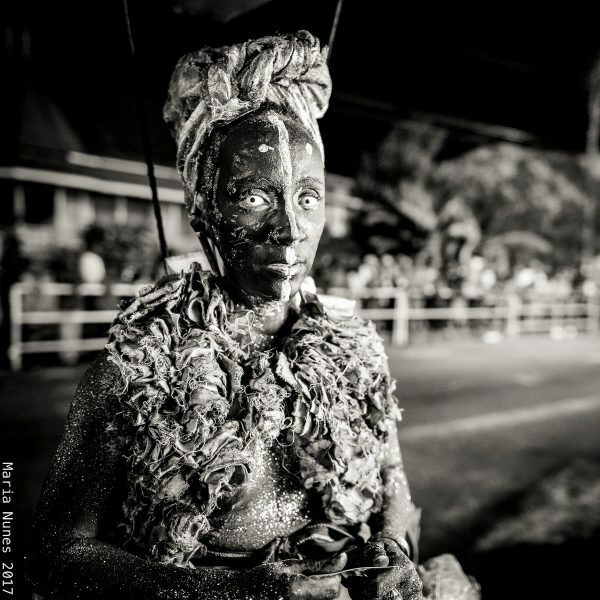 A character from the Moko Jumbie traditional mas portrayal “Storm at the Edge of a Knife” by the band “Touch D Sky”, designed by Alan Vaughan. Photo by Maria Nunes, used with permission. 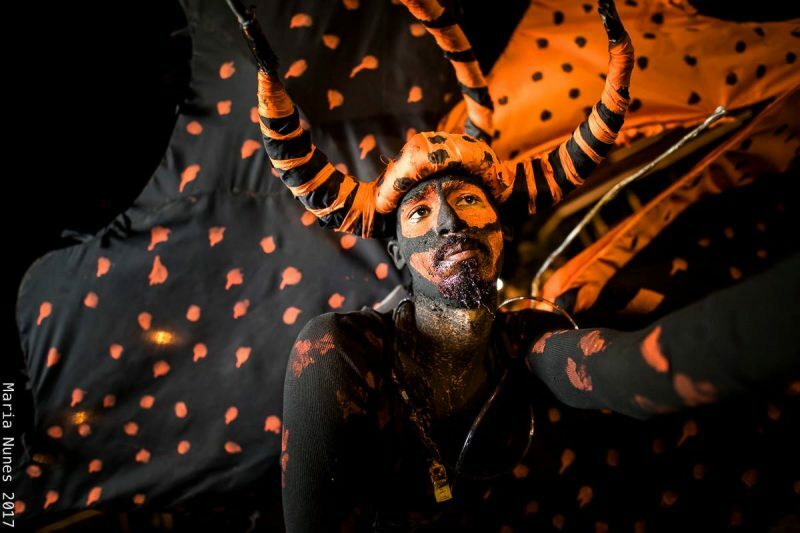 The cast of characters  that forms the traditional mas of Trinidad and Tobago Carnival is wide and varied — burrokeets (costumes that depict riders on donkeys), fancy sailors and Indians, pretty (and scary) devils, and the list goes on. Nunes caught some of the this year's very best, which included a mother and son portrayal of some intimidating folklore characters: a lagahoo (a mythical creature similar to a werewolf, but which has shapeshifting powers) and a douen (believed to be the lost souls of unbaptised children whose feet face backwards). Tracey Sankar-Charleau and her son Jude in performance as “Lagahoo” and “Douen”. Photo by Maria Nunes, used with permission. Tracey Sankar-Charleau as “Lagahoo”; photo by Maria Nunes, used with permission. Bat costumes — typically comprising a body suit, an ornate headpiece and spectacular wings — are also popular. 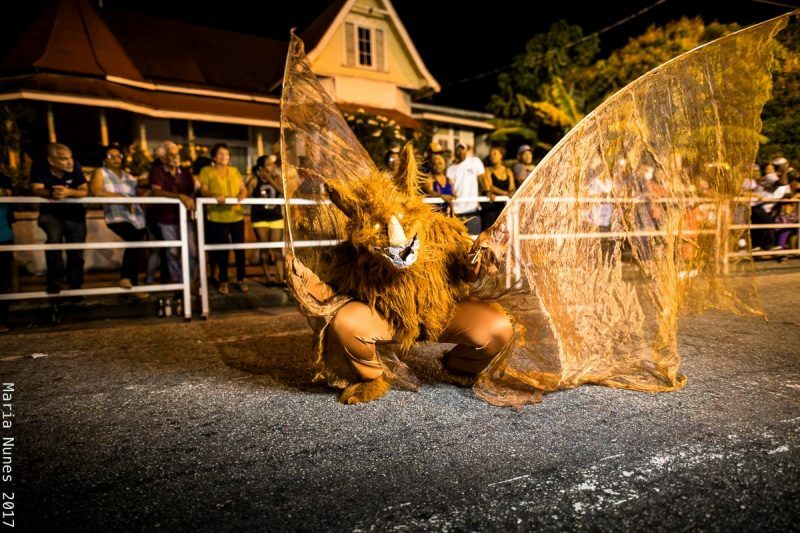 The headpiece is often made out of papier mâché and the wings crafted using the Carnival art of wire bending, but the best part of any bat mas is the dance that goes along with it: the masquerader twirls, lunges, and flaps his wings in a series of mesmerising movements that mimic how bats fly. Rosemarie Paul's bat portrayal, “What they do with my Carnival?” Photo by Maria Nunes, used with permission. 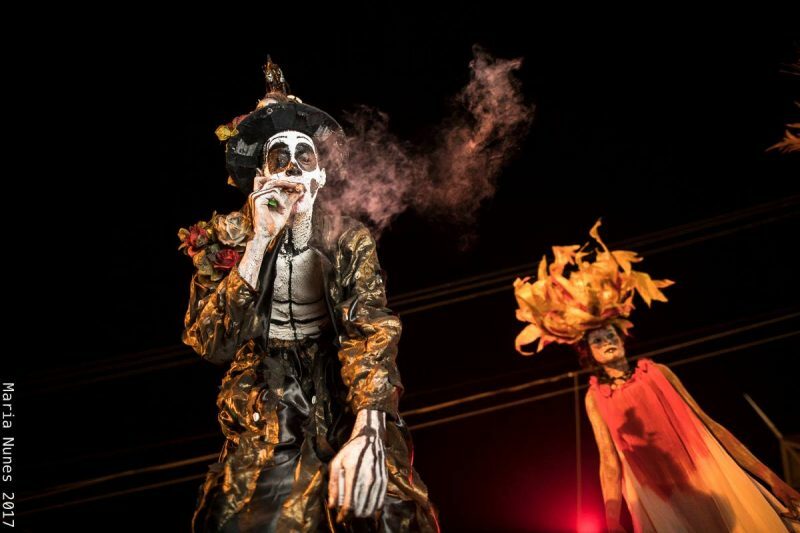 Moko jumbies, those sky-high, otherworldly stilt dancers that are rooted in West African tradition, help make Trinidad and Tobago Carnival magical. 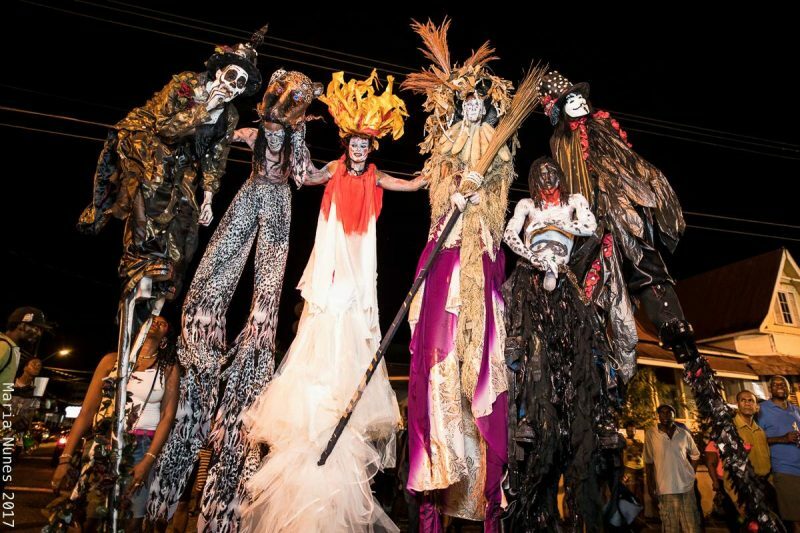 Oral tradition has it that the height of the stilts gives the jumbies the ability to discern evil more quickly than lesser (or at least shorter) mortals, so the character is viewed as a symbol of protection. The stilt walkers play their mas on stilts that are 10 to 15 feet high; these are covered by long, full skirts or flowing pants, to give the illusion of giants — it is an incredible performance to watch. “Touch D Sky” Moko Jumbies in their presentation “Storm at the Edge of a Knife”. Designed by Alan Vaughan; band leader, Adrian Young; Photo by Maria Nunes, used with permission. 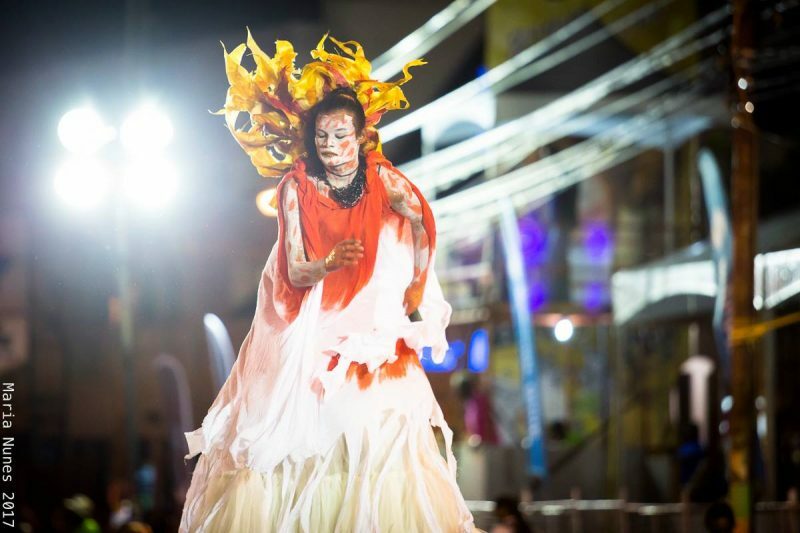 Female stilt dancer in her Moko Jumbie costume; photo by Maria Nunes, used with permission. Touch D Sky's 2017 Moko Jumbie presentation, “Storm at the Edge of a Knife”; photo by Maria Nunes, used with permission. No traditional mas would be complete without a devil portrayal. The “pretty devil” costume draws from the foundation of a mediaeval jester's costume, but it has evolved in different ways. Still, there are usually bits of colourful fabric, bells, whistles — and of course, horns, which may be crafted from a wire base and disguised with cloth. 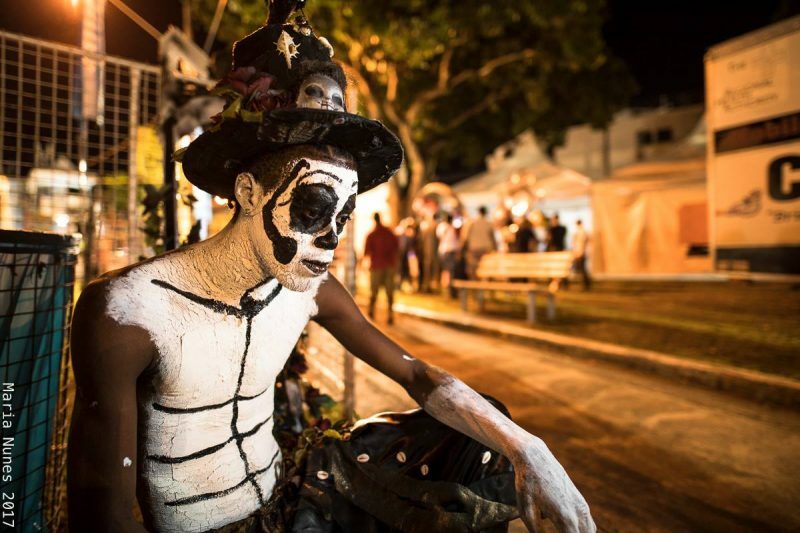 The Jab Molassie hybrid of devil mas sports a wire tail, horns and a trident; the masquerader adorns himself with chains, locks and other accoutrements, and smears his entire body with paint, grease, mud or clay. The Jab often “wines” (suggestively gyrates) to a compelling, rhythmic beat played on tin pans by imps, some of whom also hold the devil's chain, attempting to control him as he cavorts wildly in character. Ricardo Felicien's 2017 “Jab Molassie” portrayal; photo by Maria Nunes, used with permission.